I have been impressed with this clematis since first planting it. Samaritan Jo is easy to grow and comes into abundant flowering quickly and they keep coming. The silver-white flowers are large and pointy with a beautiful edging of rosy-purple which veins in towards the center. Does great in a large container too. Outstanding clematis! 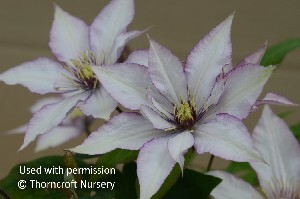 I am so happy to be able to offer this outstanding clematis again. Semu is the most unusual color of Purple blue with violet veins and a lighter bar. Free flowering too! A must have for all gardens. 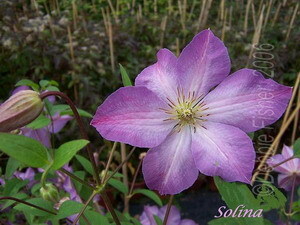 Shiko has several spellings but I am going by Clematis on the Web. 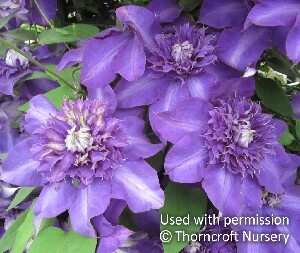 This beautiful clematis is a rich Purple-blue with a lighter blue gray bar. It is absolutely beautiful in full bloom with all the different textures. Blooms nearly all summer here. 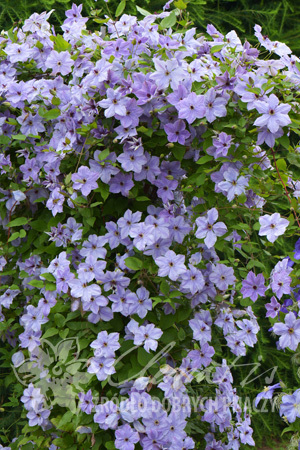 Medium pale blue with a rosy tint flowers smooth this clematis in short order.Easy to grow and wonderful to light up darker areas of your garden. 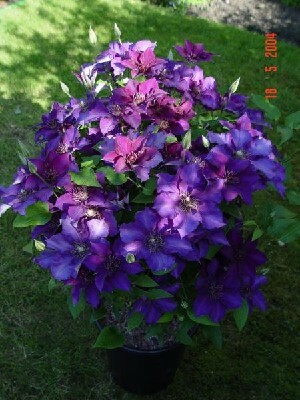 I am happy to be able to offer this outstanding clematis again. It is another favorite in my garden. Polish Breeder Brother Stefan Franczak truly outdid himself with this Beautiful light Pinky/Purple Clematis. Very free flowering. I do not cut it back at all so bloom time starts early spring and lasts nearly all summer. 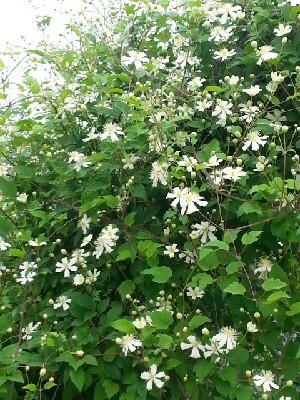 I wish you could see how vigorous this clematis is. Multiple stems are coming up like crazy this spring in all the pots. Large Dark velvety Purple flowers with a deep raspberry bar. The filaments and anthers are full and rich deep purple. Easy to grow and very free flowering. Can be treated as a type 3 as well. Does well in a pot too.